MQ Health provides specialist care of complex elbow conditions causing pain, stiffness or instability through the MQ Health Elbow Clinic. The clinic is available to all patients who are looking for a high level of specialist review. Our elbow specialists have extensive experience, expertise and training in an academic research environment. We provide care for patients who have complex elbow problems causing pain, stiffness or instability. Our dedicated specialists can help you learn about your condition – including whether you should proceed with surgery or another treatment. The elbow is one of the most complex joints in the human body. The elbow is anatomically a trocho-ginglymoid joint, meaning that it has trochoid (rotatory) and ginglymoid (hinge-like) motion. An understanding of the complex bony anatomy of the elbow, the soft tissue’s that provide stability as well as an intimate understanding of the nerves and vessels that surround the elbow joint is imperative when surgically treating this very intricate and complex joint. Many people are prone to elbow injuries, whether through work, sports or an unexpected fall. Major injuries often require surgery. The elbow joint can undergo degenerative change leading to arthritis with pain and stiffness. The elbow joint may also become unstable due to ligament tears usually due to certain repetitive movements or an injury. In most elbow conditions, surgery is only required if all other non-surgical treatments haven’t produced the desired result. Dr Sumit Raniga is a Fellow of the Royal Australasian College of Surgeons. 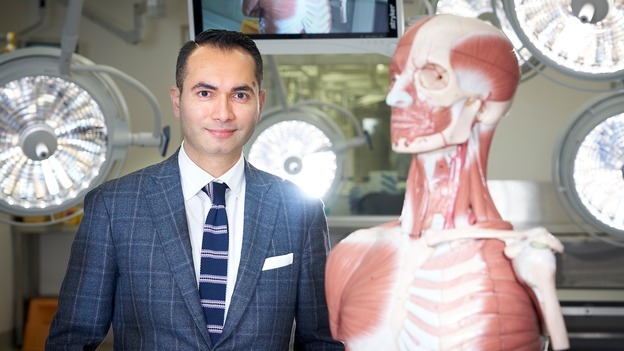 A subspecialist orthopaedic shoulder and elbow surgeon, Dr Raniga has three years of dedicated post-fellowship training in world-renowned centres of excellence. Dr Raniga provides the highest standard of evidence-based management and surgical treatment of complex elbow problems. The MQ Health Elbow Clinic offers both non-surgical and surgical treatment options for the full range of elbow conditions and injuries.